Medical billing and a mental health billing are not similar, as the medical billing are easy to get depending on the medical problem, whereas the Mental health billing needs an extra care as it will be difficult to get the insurance claim processed for this. We shall discuss about the claim and processing at the later part of this article. Are you a person who treat people with ill psychologically conditions? Do you treat people with various mental health disorders/issues? Are you a private practices who do counselling for the mentally retarded people? Are you a psychiatrist/counselor who treat mentally ill persons? 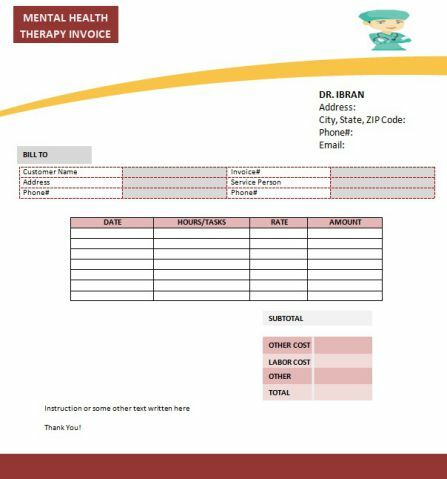 Are you looking for invoice template to issue your patients post treatment? Then, here are the most adorable/straightforward and easy templates with all necessary components to fill every detail regarding the treatment which can even be used to claim insurance. All you have to do is to just download these free printable templates and use it. You can even customize it as per your requirement, if you feel like adding or removing ay components in the template. Without any further delay let us have a look on the components of the mental health invoice as follow. Clinic/Therapist/Psychiatrist Name – This might vary according to the person who provided the treatment. If you practice as a Therapist or Psychiatrist, then you can provide the Name of the clinic we you work along with the address and contact details. Or if you practice separately and treat patients directly then your name, address and contact details can be given in the Invoice. Service Description – Detailed description of the kind of service provided to the patient on that particular day. No – Any therapist who treats a patients need to have a registered license approved by the government and the same needs to be mentioned in the invoice as well. Tablets prescription – If any tablets are prescribed then the corresponding name of the tablet along with the Quantity purchased and the total amount can be given. 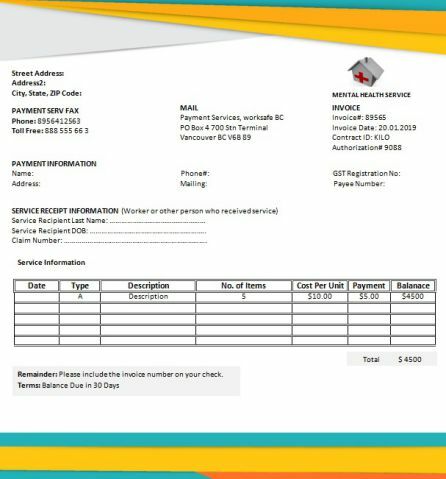 This can be given in the tabular form in the Invoice. Mentioned above are the common and basic details that needs to be mentioned in any invoice. 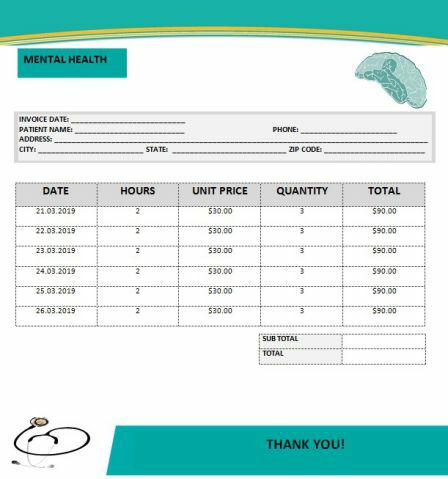 And you can find here plenty of such mental health Invoice templates for your use. You can download these for free and add/remove or customize the template according to you need and use it to invoice your clients. Mental health services vary from the stage of diagnosing/identifying the mental problems to treating and providing proper guidance like connecting to psychiatrist/counsellor to assist with the symptoms or illness. Post diagnosing or counselling sessions the patient needs to be provided with the bill/Invoice. Invoicing is important at all stages of mental health service. These invoices can be provided by a licensed physician or chemist or counselors or psychiatrist. It is important to get treated by a licensed therapist. Are you a mental health service provider or professional? An individual who provide mental health service? Are you in search of a simple and proper billing template to Invoice your patients? Then here you go with such free printable templates you can download and use it handy. It is good to invoice the patients on every meet/session for out-patients. In case of hospitalization or in-patient then recording everyday treatment and billing during the discharge is a normal type. If in case of any insurance claim is applicable the billing needs to be generated accordingly depending on the condition of the patient. There are different kinds of treatments that can/need to be provided for people with mental health disorders/illness depending upon their condition and stage of illness. Considering those facts we have listed below few types of treatments that can be provided and their billing details for your reference. A person who is affected with mental disorders initially can be assessed by a doctor or a general practitioner. Here the physical health of the person also needs to be treated equally. At later point, if required they can be referred to get treated by a psychiatrist who has specialization in treating people with mental illness. For people who are affected more or in advance stage of mental disorders will be advised to contact a psychiatrist. The billing and charges by these doctors and psychiatrists depend upon the number of sitting and sessions attended based on the illness. Such type of free printable templates are available here for you to just download and use it with any modifications required. Mental illness at early stage can be treated by means of attending counseling sessions with the psychiatrist or therapist and making it get cured. But in case of severe and advanced stage of the illness it is highly good to admit the person in a hospital and get treated, were 24 hours inpatient facility would be available or places like residential treatment centers that will provide a homely feel and treat the individual accordingly. The billing in hospitalization may be pre or post hospitalization depending upon if any insurance claim is available for the patients and the terms of the insurance company. In general, the billing can be processed at the time of discharge with all the detailed description of the health problems and the treatment provided with the tablets taken if any and so on. 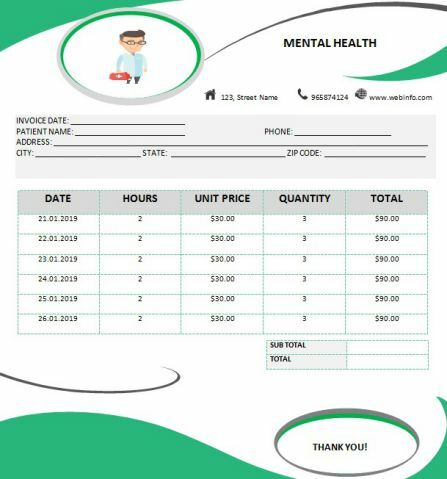 If you are looking for such hospitalization billing templates for mental health illness, then here they are for you to use it instantly with just one click by downloading it for free. Mentioned above are the two treatments for mental health problems. Apart from these the patients might be recommended for various meditation or yoga programs or can be prescribed with only medicines depending the illness or chances of attending online therapies. 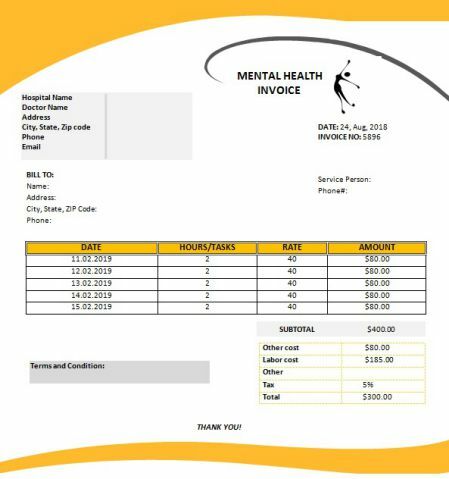 For all kinds of mental health treatment invoicing you can access templates from here for free. The patients might be charged with an advance fee, as there are high chances for them to get moved on to any other treatment. Also to charge as and when the sessions/treatments ends during the time of hospitalization treatments. These are two main things to be noted while charging any mental health service. Does insurance cover mental health? How to add insurance cover in invoice? For those who have a question on, if the Mental illness will get covered under insurance. Here is the answer, of course yes, like any other medical problems the mental illness can also get claimed under health insurance. But the terms and conditions will differ depending on the Company. Have the policy Number added to the bill. Once the invoice is generated with all the treatment details. Submit it to the insurance company with-in the stipulated time of your plan to the right address. This will help in getting your claim processed at the earliest. Not all insurance plan might cover online therapy. But yes, few plans will cover. So it is better to check with the plan details of the insurance company if online therapy is getting covered or not. As it might even have a check like the therapist should be in the same state or different state, which will vary depending on the plans. While there is no such fixed rate, the psychologists/therapists might charge a minimum of $75 and it may vary to even $500. Few might charge depending on the income of the patient as well. This highly depends on the kind of treatment that is provided and the condition of the patient. As this is applicable for reimbursement under the insurance claim the treatment would cost accordingly and varies/differs from place to place and hospital to hospital. There are different mental health care plan available. In general the reviews might happen from four weeks to six months. For any further review, it might happened three month post first review. Yes, as mentioned earlier this is plan specific and depending on the plan it might vary. On identification of a mental health problem, the doctor would provide a plan depending on the health care needed for improving the mental strength depending on which the further treatment would be provided. This is known as mental health plan. Please note, all the above mentioned details are result of information from various sources and are subject to changes depending on the type of insurance plan and the condition of the patient.